Harley Davidson Leather Jacket. Size Medium. Embossed Eagle on back. Heavy weight,Quality Jacket. motorbike jacket leather L. No pads but has the slots to add arm shoulder and back protection strong very heavy jacket it was too big for me, barely worn , never used on a bike make : biker gear its a slight mix of real hard leather and real sued feel leather , if was a size smaller I’d keep it but bought a medium as having a sort out Condition is Used. Dispatched with Royal Mail 2nd Class. EARLY 1980's BLUE LEWIS LEATHERS MOTORCYCLE BIKER JACKET. Hein Gericke Cruise jacket, Cordura GoreTex jacket. One of the best pieces of motorcycle clothing I have owned. Genuine Mens Harley Davidson Jacket. Dispatched with Royal Mail 2nd Class.never been worn as new. Heavy Leather Jacket in good used condition. Genuine Leather. This action is for a matching Belstaff jacket and trousers. Check out the pictures for colours and condition. Both have a lining that can be removed and the trousers zip to the jacket. I can't say that they are still waterproof - but I would personally not hesitate to use them in the rain if I had a bike again. Used ,heavy weight leather, great quality for price, has a few wear marks but no cuts or scratches. Will fit ladies size 10 to 12. New listingRICHA Motorcycle jacket. Size LARGE Black and red. Condition is used. Back, elbow and shoulder protectors. Two zipped slip-in front pockets. Very good condition and has been a great jacket. 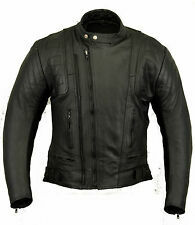 Top Gear leather motorcycle jacket in size 3XL. However, I normally wear an XL / size 44in chest and this jacket fits me perfectly. The jacket is in perfect condition, and has never been worn on the track or road. From a pet and smoke free home. Sold as seen, no refunds or returns. Ladies/womans Leather Victory Motorbike Jacket Condition is Used. Dispatched with Royal Mail 2nd Class. Cruiser Motorcycle - Retro. Motorcycle Jacket. Thick Quality Leather. Would Look Great On Any Muscle /. Smug Black Leather Motorcycle Jacket. Jacket Is A Size 40. I Don't Want To Remove These As They Suit The Jacket & It's History. Has Various Badges & History Including Dragstar Pin Badge, 2013 Pin Badge, Support Our Soldiers Pin Badge, Ride Of Honour Pin Badge. Here is my official Harley Davidson leather jacket, this jacket is used but overall in great condition still with its original tag. This jacket makes for a perfect summer jacket and is very well ventilated. selling because I’ve since sold my Harley :( Dispatched with Royal Mail 2nd Class. Mens Sportex Black Leather Motorcycle Jacket Size 38EU Harley Retro Biker. Label says 44 but 38 " is what the tape says Condition is Used. Small opening in the lining Please see pics Otherwise in an acceptable vintage used condition Dispatched with Royal Mail 2nd Class. Keep cool for the long, hot ride. EN 1621-1 CE-approved removable body armor at shoulders and elbows gives you extra protection. Cost over £400 when I bought it. EXCELLENT JACKET! HEAVY WEIGHT VERY WARM for winter Zip vents make it very cool for summer It is a very HANDSOME jacket! Vintage 70s Ladies Genuine UK Made Leather Motorcycle Jacket With Rear Tassels. Red quilted lining. Measurements are 34” chest . From back neck to bottom 21” under arm to cuff 16” Condition is Used. Dispatched with Royal Mail 2nd Class. 2 IN 1 JERSEY BLACK GILET & JACKET IN GREAT CONDITION. HARLEY-DAVIDSON AMF VINTAGE LEATHER JACKET. REDUCED !!!!!!!!!! If you are heading out for a ride on your classic cruiser bike you need a jacket to keep you protected as well as looking stylish. Here on eBay, there is a wide range of motorcycle cruiser jackets to keep you safe yet fashionable when out riding. Cruiser jackets are synonymous with an image of a laid-back motorcyclist who’s built their own custom bike and loves nothing more than cruising along on the open road. Team with a white t-shirt, jeans and black leather boots à la James Dean in Rebel Without a Cause. Cruiser jackets are loose fitting, yet structured which means you can always recognise the cut, shape and style of this classic motorcycle garment. Perhaps the most style conscious of all the motorcycle jacket types, fans of the classic cruiser look can choose from used styles including vintage leather biker jackets. Traditionally cruiser jackets are made from leather, however, you can also find lightweight versions in breathable fabrics such as GORE-TEX, cotton and polyester. Take your pick of cruiser jacket made by iconic manufacturers including RST, Alpinestars, Merlin, OSX, Rev’it, Spada and Harley-Davidson. With a wide variety of jackets to choose from in men’s, women’s, unisex and children’s cuts you’re sure to find the perfect cruiser jacket to suit your style. Cruiser jackets are available in classic blacks and browns; however, the more daring may want to try greys, reds, blues and whites. Cruiser jackets are designed for cruising and cruising alone, which means slower speeds and a reduced risk of serious injury. For that reason, cruiser jackets don’t tend to include built-in armour, however, you may find a few newer styles that give you the option to add removable armour and are waterproof. If you’re safety conscious and would prefer a little more protection, it’s possible to buy armour that can be worn separately, underneath your jacket.